The double door will be opened from 8PM on June 19 till 4AM on June 20, JST, according to TEPCO's press release on June 19 (in Japanese). TEPCO has been running the air filtering system in the Reactor 2 reactor building in order to lower the radioactive materials in the air inside the building since June 11. The company is hoping to reduce the amount of radiation to one-tenths before they open the double door to the reactor building. The Reactor 2 reactor building shell is relatively intact, causing the very high humidity and temperature, hindering any work by carbon-based workers inside. By opening the double door, they hope to drive out the moisture and humidity enough so that they can send in the workers. Well, the amount of radiation doesn't seem to have dropped at all, as you can see in the chart below (by TEPCO, as a handout at the press conference on June 19), but they are going to open the double door anyway. It was the same story for the Reactor 1; the air filtering system didn't lower the radioactive materials in the air, but they opened the double door anyway, claiming the level got lower. All for the show, except it exposed the workers to unnecessary radiation when they were sent in to install the air filtering system. If TEPCO knows it is a futile effort to install air filtering system before opening the double door, why does the company do it? It's for the public consumption, to show that TEPCO is doing everything they can to ensure the lower radiation level for the workers and for the community (which has all but evaporated). And to keep the regulatory agency, NISA, happy. And why do they open the double door at night? As I said when they opened the double door to the Reactor 1 reactor building, this one is for the maximum effect of letting the inside "hot" air out as much as possible, using the air temperature difference between inside and outside. The relatively intact building shell may hinder the air exchange though. We'll see. I'll look forward to seeing the gamma-ray photos of the reactor. #Radioactive Tea in France: Shizuoka Governor Tells France Tea Is Safe, "No Problem"
Besides, the tea leaves may not be from Shizuoka anyway, says his government. Governor Heita Kawakatsu of Shizuoka Prefecture issued a comment in response to the French government's announcement that the radioactive materials have been detected in Shizuoka tea in excess of the safety limit, and said "Even if the final blend tea measured 1,000 becquerels/kilogram, when you brew it the number will go down to about 10 becquerels. I don't think there's any problem at all if you drink the tea." He emphasized the safety of Shizuoka tea showing the survey done by the prefecture. He added that his government "will verify the French information, and investigate the export route." The Economy and Industry Division of the Shizuoka prefectural government, who is in charge of export control of the teas from Shizuoka, said it was possible that the tea tested in France was final-blended in Shizuoka, but that didn't mean the tea leaves themselves were grown and harvested in Shizuoka. The division said the tea leaves from other prefectures and even from overseas are processed in Shizuoka and then shipped. I don't have a PhD so I defer to the expert judgment of the governor, who must know more than we the mere non-PhD mortals do. #Fukushima I Nuke Plant: Kurion's System Was Stopped At the Very First "Skid"
According to TEPCO's handout for the press for June 18, TEPCO stopped the entire water processing system manually when the surface radiation at the "skid" for removing oil and technetium exceeded 4 millisievert/hour, the limit set for replacing the zeolite cylinders (which TEPCO calls "vessel") inside the skid. The water contained too much seawater for the system to handle. By the way, the skids were welded and fabricated by a company in Delta County, Colorado, called Industrial Systems, Inc.. According to the Delta County Independent's article on June 18, 2011, ISI has tripled the number of workers - welders, fabricators, machinists - to 75 to work 24/7 on the project, which for them now includes internal components for filter assemblies in addition to the skids. The radiation limit of 4 millisieverts/hour was reached in 5 hours, instead of one month as anticipated. The radiation level on the cesium absorption towers (cylinders) reached the limit [4 millisievert/hour] in 5 hours. The limit was supposed to be reached in a month. There is a possibility that the contaminated water contained the sludge with extremely high level of radioactive materials. TEPCO hopes to investigate the cause and re-start the operation within a week. TEPCO had better hurry. The water levels in the trenches leading from the Reactors 2 and 3 are rising again, even as the Ministry of Economy, Trade and Industry (METI) has stopped disclosing the information on water levels. The Reactor 2 pit water is about 30 centimeters from the top of the pit, the Reactor 3 pit water about 15 centimeters from the top of the pit. The water treatment system for the highly contaminated water at Fukushima I Nuclear Power Plant has been stopped by TEPCO in the early morning of June 18. The system had been on the full "hot" run since 8PM on June 17. The full run was halted in less than 6 hours due to high radiation level on the cesium absorption towers by Kurion. The water treatment system is supposed to treat 1,200 tonnes of highly contaminated water every day, or 50 tonnes per hour. TEPCO announced on June 18 that it stopped the water treatment system for the highly contaminated water at Fukushima I Nuclear Power Plant at 12:54AM on June 18. The stoppage was not due to system malfunction, TEPCO explained. The company stopped the system when the radiation level of the cesium absorption subsystem [by Kurion] had reached the set limit earlier than expected. TEPCO had planned to start the cooling water circulation system whereby the treated water is injected back into the Reactor Pressure Vessels on June 18, but it is not clear whether it will start as scheduled. The cesium absorption subsystem is set up inside the Central Waste Processing Facility. There are 4 rows of 6 cylinders that contain cesium absorption material [zeolite], and when the radiation level reaches 4 millisieverts/hour the cylinders are to be replaced. According to TEPCO, the system started the full run at 8PM on June 17, but the worker who was remote-operating the system noticed that the radiation measurement device on the surface of the cesium absorption cylinders was 4.7 millisieverts/hour. Remember the news on June 3 about 2 TEPCO employees working at Fukushima I Nuclear Power Plant exceeding 600 millisieverts in radiation exposure, with extremely high internal radiation? At that time, the blame was placed on the workers for not taking the potassium iodide pills as scheduled and not wearing masks - what disregard for safety! When the management blames workers, the management is hiding something bigger and more serious, I've been told. No newspaper or TV station pursued the news after June 3, until TEPCO announced the result of its investigation of the incident on June 17. As I had suspected, it had nothing to do with the workers' errors. They wore dust masks as instructed, and even those they had to take off to eat food, and there was a gap between the mask and the eyeglasses for one of the workers that cannot be closed due to the design. As to potassium iodide pills, they didn't take them initially because there was none where they were (the central control room for the Reactors 3 and 4), when they mattered most (March 11 and 12 and 13). They were working, eating, sleeping in the central control room for the Reactors 3 and 4 until 4PM on March 13, with dust masks and no potassium iodide. 1. The 2 workers worked mostly in the central control room for the Reactors 3 and 4. On March 12, long before the Reactor 1 building blew off (3:36PM), the radiation level started to go up as indicated by the exhaust pipe monitoring at the central control room, around 5:04AM. The manager in charge of the shift at that time instructed the workers to wear dust masks inside the control room, and charcoal masks when going outside. The 2 workers followed the instruction and were wearing dust masks. Dust masks cannot filter out radioactive iodine, and charcoal filters may have become less effective as they were used for extended period of time until the fresh supply could be delivered. At that time, there were 15 charcoal masks, 50 pairs of charcoal filters, and 300 masks [without filters attached?面体] for the Reactors 3 and 4 workers. One of the workers wore eyeglasses, and that left a gap between the full-face mask and the face. There is no way to seal the gap, according to TEPCO. The 2 workers had to eat and sleep in the central control room until 4:00PM on March 13. While eating emergency food in the central control room, they had to take off the masks. The door to the central control room got warped by the impact of the Reactor 1 bldg explosion, and didn't properly close. When the Reactor 1 building blew up on March 12, there were workers outside working without any mask. TEPCO had 30,000 pills stored in the building off the Reactor 1 (where the plant headquarters are; many workers still live there) prior to the accident. They were not stocked at the central control rooms. The company instructed on March 13 [AFTER the Reactor 1 building blew up on March 12] that the workers less than 40 years of age take potassium iodide pills. For the workers 40 years of age and above, the pills would be given if they requested. The 2 workers couldn't start on the pills until they moved to the building where they could get potassium iodide until 4:00PM on March 13. This is borderline criminal, particularly about potassium iodide. From the detailed reports that TEPCO suddenly disclosed in mid May, the company knew from the beginning of the accident (evening of March 11) that the reactors may have been breached; they were measuring a very high air radiation at the plant on March 11, which they correctly attributed to a breached Reactor Pressure Vessel. They also knew the venting of the Reactor 1, which was scheduled on March 12, would release a large amount of radioactive materials in the air. And they waited until March 13 to instruct workers to take potassium iodide? And the company had a gall to blame its own workers at first. Now that it has turned out that the company was to blame, the incident is due to the unfortunate confusion in the early days of the accident. After changing the "rupture disks" for the Kurion's part of the system and blaming the workers for closing the valve by mistake, TEPCO has started the full run, using "hot" water that they have in abundance (over 110,000 tonnes of it) at Fukushima I Nuclear Power Plant. It must mean they were really running out of space to store the highly contaminated water, and have decided to run the full system made up of 4 different components by 4 different vendors (Kurion, Areva, Toshiba, Hitachi) with what looks to me like a very short test run. Or is this normal time-frame for a test run of the system like this? I'm no expert so I don't know for sure. If the "hot" water ever leaks like the low contamination water did (to the tune of 6 tonnes), I hope TEPCO and the participating companies have a plan ready to fix the leak. Even the cesium absorption towers (cylinders) need storage space after the run every day. TEPCO will need to replace one a day. A system to decontaminate highly radioactive water has gone into service at the Fukushima Daiichi nuclear plant. The system is considered key to dealing with the build-up of contaminated water that is hampering work to bring the reactors under control. Tokyo Electric Power Company, or TEPCO, activated the system on Friday evening after conducting final test-runs. The utility earlier found water leaking from one of the system's 4 components -- a US-made cesium absorption device -- forcing the test-runs to be called off on Thursday. TEPCO later determined that a mistakenly closed valve in the pipes had clogged the water, which then damaged a safety valve in one of the absorption units and caused the leak. The broken valve has been replaced. Highly radioactive water is building up in reactor facilities at a rate of 500 tons per day. TEPCO hopes to cool the reactors by decontaminating the runoff and re-circulating the water. Stable operations of the decontaminators will now be important, as the system has suffered glitches both before and during the test-runs. Accordingly, the safety valve, called the "rupture disk", ruptured as designed to release the pressure and let the water flow out, according to Asahi Shinbun (in Japanese; 12:01PM JST 6/17/2011). Why did the pressure go up in that particular set of towers (most upstream of the 4 sets)? Because a valve was closed shut downstream. TEPCO hinted it may have been a human error, that a worker closed that downstream valve by mistake. The total amount of water leaked was more than 6,000 liters [or 6 tonnes]. TEPCO will replace the ruptured "rupture disk" as well as the same disks for the other three sets of towers, and hopes to start the full run by midnight on June 17. I was told by a former TEPCO nuclear plant engineer that something else is likely involved when the company wants to blame workers for a malfunction or an accident. We'll see if that's the case here. The contaminated water situation must be getting really bad for TEPCO to hurry on with the full run that will process the highly contaminated water heavily mixed with seawater. On the side note, Yomiuri Shinbun reports that the CEO of Areva, Anne Lauvergeon, will not be reappointed at the end of June, in the decision made by the office of the President of France, despite the urging by the company's executive board. Areva is 90% owned by the French government, and the CEO is rumored to have had disagreements with President Nicolas Sarkozy. The new CEO is going to be Luc Oursel, current COO of the company in charge of international marketing and projects. Oursel's name was missing in the letter by the company's executive board urging the reappointment of Anne Lauvergeon, as Reuters reports. Japan must be the least suited country in the world to deal with an emergency situation, because it doesn't recognize it is an emergency. Thanks to the net, though, people are speaking up even in Japan and spreading information. Here are two such examples, tweets in Japanese from Japan. They could be what their government and its apologists call "baseless rumors", but I doubt it although 'm not giving any guarantee that they aren't. First, a tweet from @tatsuofujii 藤井　辰雄. He says he became a farmer in Inawashiro, Fukushima Prefecture three years ago. He evacuated after the Fukushima I Nuke Plant accident, and says as a responsible producer he wouldn't grow and sell vegetables if there is even a slight possibility that his vegetables may harm children and women capable of becoming pregnant. I sense that people are getting less vigilant as days go by. But I warn you, as a farmer who has taken much pride in growing the best vegetables possible, that more than 99.9% of the agricultural produce shipped are not tested, even today. The test for radioactive materials is done by sampling in one farm plot per city/town/village. The "safety declaration" by municipalities are being issued, based on this flimsy testing. So that's how Shizuoka Prefecture may have tested their teas: one bag from one factory per one tea growing region. Unfortunately for the governor of Shizuoka, a Tokyo grocer did the independent testing, and he had to order the testing at all 100 factories in that one particular tea growing region. Here's a tweet by a medical doctor, @KamiMasahiro 上　昌広. His Twitter profile says he is a doctor in internal medicine, and the site he lists on Twitter goes to the Tokyo University Institute of Medical Science, and he is a professor in the Division of Social Communication System. Message from the doctor I worked with in Iitate-mura [in Fukushima Prefecture], when we gave medical advice to the villagers. I don't know what they [the government ministries] are thinking. "Today, our hospital received a written notice signed by both the Ministry of Education and Science and the Ministry of Health and Welfare. The notice says "The medical checkups and research of the residents in the areas affected by the nuke plant accident are allowed only if the permission to do so is given by the related scientific societies and associations; otherwise it would only increase the burden on the residents."" TEPCO was running the test of the entire contaminated water treatment system since 12:20AM JST, June 16, but the test has been halted because of the leak found in one of the cesium absorption towers after 19 hours of running the test. The company was planning to run the test with the low contamination water for 30 to 40 hours before the full operation of the system with the high contamination water. It looks to be part of the Kurion system which uses a series of towers filled with zeolite to absorb radioactive cesium. Murphy's still alive and well at Fukushima. TEPCO disclosed on June 16 that there was a leak in one of the subsystems during the test run of the entire water treatment system that will treat high contamination water at Fukushima I Nuclear Power Plant. The system was shut down automatically. According to TEPCO, it may take at least half a day to identify the location of the leak and repair. It is increasingly likely that the full-scale operation of the water treatment system, which is scheduled to start on June 17, will be delayed. The leak was found in one of the cylindrical equipment to absorb radioactive cesium. The alarm sounded off at 7:20PM JST [on June 16] and the system was shut down automatically. At 8:00PM, the workers went in and visually confirmed the leaked water 30 centimeter deep inside the metal box that houses the cylinder, 90 centimeter in diameter and 2.3 meter in height. The water had spilled outside the box, too. TEPCO said the detailed investigation was needed to figure out what had caused the leak. The series was made before the Fukushima I Nuke Plant accident, in Japanese. Now the creator has made the entire series (5 videos) in English. Tama is the name of Uncle Genpachi's cat, who stands up and starts to speak in anger on hearing misinformation about nuclear energy or nuclear power plant. It's quite funny and informative at the same time. Each video is no more than 3 minutes, but to the point. Once a malicious "baseless rumor" on the net, now it is written up in a regional newspaper with readership in Tokyo and Kanto area. Tokyo Shinbun (paper edition only, 6/16/2011) reports that many children in Koriyama City in Fukushima Prefecture, 50 kilometers from Fukushima I Nuclear Power Plant, are suffering inexplicable nosebleed, diarrhea, and lack of energy since the nuke plant accident. On June 12, a non-profit organization called "The Bridge to Chernobyl" (チェルノブイリへのかけはし) held a free clinic in Koriyama City in Fukushima Prefecture, 50 kilometers [west] from Fukushima I Nuclear Power Plant. Worried about the effect of radiation exposure, 50 families brought their children to see the doctor. A 39-year-old mother of two told the doctor that her 6-year-old daughter had nosebleed everyday for 3 weeks in April. For 1 week, the daughter bled copiously from both nostrils. The mother said their doctor told her it was just a seasonal allergy from pollen. Her other child, 2-year-old son, had nosebleed from end of April to May. The pediatrician from The Bridge to Chernobyl, Yurika Hashimoto, told the mother it was hard to determine whether the nosebleed was the result of radiation exposure, but they should have the blood test done for white blood cells. It was important to keep record, the doctor advised. The family move out temporarily from Koriyama City to Saitama Prefecture after the March 11 earthquake, but came back to Koriyama at the end of March. The mother said about 10% of pupils at the elementary school have left Koriyama. Each school in Koriyama decides whether to have the pupils drink local milk that the school provide, which tends to concentrate radioactive materials. In her daughter's school, it is up to the parents to decide. But the mother said she let the daughter drink milk with other children because the daughter didn't want to get excluded by other children for not drinking milk with them. A 40-year-old father of a 4-month-old baby daughter was so worried that he never let the daughter go outside, even though she didn't exhibit any ill effect of radiation so far. He said, "I'm so worried. I don't know how to defend ourselves." I [the reporter of the story] used the radiation monitoring device over the low bush near the place where this event was being held. It measured 2.33 microsieverts/hour. As I raised the device higher, the radiation level went down to 1 microsievert/hour. The highest air radiation measured in Koriyama City was 8.26 microsieverts/hour on March 15. Since middle of May, it has been about 1.3 microsievert/hour. A 40-year-old mother with a 6-year-old son was angry, and said "Doctors, researchers, they all say different things. I don't understand how the evacuation areas are determined. Take Iitate-mura, for example. They just let the villagers get exposed to high radiation for a month, and when the air radiation level got lower they told them to move out. We can't trust the national government, we can't trust Fukushima prefectural government." Her family just built a new house, and she was not sure how they could survive economically if they moved. If they moved, when would they be able to come back? What about cost of moving, or the psychological effect on her child? She just couldn't decide what to do. My friend's friend's friend "j" attended not just one but two demonstrations in Tokyo (one in Nerima-ku, and the other, bigger one in Shinjuku-ku) and sent her level-headed and frank observation (original in Japanese). Volunteer organizations collecting donations during the demonstrations in a manner that ordinary Japanese find hard to say no. The first point is not surprising to me. It is like the neoconservative right claiming to be the leaders of the "tea party" movement in the US. But I've never read about their presence in the demonstration anywhere else. The second one is not so surprising either. Trust in the government runs deep, not just in Japan but elsewhere. It is more likely that TEPCO has been obliged to do whatever the government has ordered them to do, including not disclosing the information, but the people's anger are being cleverly directed to the big bad greedy capitalist TEPCO. The last one reminds me of a street musician group in Paris 10 years ago. They were playing wonderful music, but as we listened, a person with a donation box came and stand in front of the audience, stuck the donation box in front of my face and asked for money. I thought that was crass, not befitting the superb music they were playing. Still, "j" seems to think it was a significant event, just to show to the rest of Japan and the world that there are people in Japan who are anti-nuclear across the different political and social spectrum. Yesterday [June 11]'s Shinjuku had a sizable crowd (though not that big considering how big Tokyo is) and a decent action, enough to dispel my vague dissatisfaction with the "Nerima Action" demonstration in the morning. But things didn't feel quite right for me, and that feeling started from the Nerima demonstration in the morning. I decided to participate in the "6.11 No-Nukes One Million People Action" event for 2 reasons: One, it was a grassroots movement; and two, it was to appeal for no nuclear energy. But then, the Japanese Social Democratic Party was right there at the demonstrations, free-riding the grassroots movement. I thought this was the people's movement, the small individual citizens groups got together and joined forces. I was rather disgusted to see the Social Democrats there. The Party's flags were waved in the Nerima event, same in Shinjuku, then the Party's PR car came and some party Representative started to make a speech. For me, participating in the event as an ordinary citizen, it felt like I was forced to become a supporter of the Social Democratic Party. If a political party was going to be involved, I would have liked to know it from the beginning. The Social Democratic Party became a coalition partner when the Democratic Party of Japan first became the ruling party. That means these Social Democrats accepted the DPJ's manifest of promoting nuclear energy. Now they're trying to hijack the movement saying they have been anti-nuke all along? Give me a break. Makes me wonder whether I should participate in a no-nuke demonstration from now on. I'm not happy with the slogans at the demos either. The whole point of the demonstration was to appeal for "no nuke". "Shimzu [TEPCO's president], come out!!" or "Do something quick about Fukushima I Nuke PLant!" (they ARE doing something at Fukushima I) - that's another demonstration, isn't it? I'm OK with the statements like "TEPCO should stop all nuke plants and decommission them" and "TEPCO should disclose all information." If you're going to hold TEPCO responsible, you should also demand the dismantling of the government corporations for nuclear energy which haven't done sh-t [her word], and shout "NISA, come out! Everyone who's promoted nuke plant, come out!" It felt strange to me, holding only TEPCO responsible. Not that TEPCO is not responsible, but they are not alone, are they? And then, the choice of the Alta Plaza [for Shinjuku demonstration] wasn't good. Oh wait, was it good? It's called "plaza" but the place is actually very small. So, even the small number of people could look big. The "Alta Plaza Effect", so to speak. Tokyo doesn't have a big space like the Concord Plaza [Place de la Concorde, in Paris, France]. To me, a big demonstration is the one that would fill the Concord Plaza. Also, donation solicitation was pretty awkward. The event, as far as I knew, was voluntary. But people came for money in Nerima and Shinjuku, saying it cost money to prepare for the demonstrations so please donate. They stuck a donation box in front of the participants. As a Japanese, it was difficult to say no, but I didn't like it. In Nerima, I donated 10 yen [12 cents] (I'm cheap) because they were what they said they were. But in Shinjuku, I couldn't tell who they were. So I ignored them. Same with signature gathering. No one beside me seemed to care very much who they were signing for and gave away the personal information like name and address. It's not safe to give away your information in the excitement of the event, without much thinking. Overall, my feeling was that Japanese people are inexperienced when it comes to demonstration. Still, I think it achieved the purpose of appealing [to the rest of Japan and the world] that there are people in Japan who are against nuclear power, regardless of the social status or political leaning. I think in the future it may be better to organize the event as some kind of a festival in a big venue like baseball stadiums, soliciting donations beforehand to plan for the event, and selling tickets (500 yen for admission and a drink, something like that) for people to participate. TEPCO finished the testing of Areva's decontamination system (no word yet as to how successful it was) and started the test run of the entire system (oil/strontium removal - cesium removal (Kurion) - decontamination (Areva) - desalination) at 12:20AM JST, June 16. The test is scheduled to run for 30 to 40 hours before the full run starts with the high contamination water sometime on June 17. I still don't quite get it. Why did TEPCO (or the Japanese government) need both Kurion's and Areva's systems? They both treat the same radioactive materials - strontium and cesium. It looks like a political arrangement to me, as the US couldn't just let France's Areva take the credit for cleaning up the contaminated water at a nuke plant with the wrecked GE reactors. The operator of the damaged Fukushima nuclear power plant has begun testing a complex system to decontaminate highly radioactive wastewater. Tokyo Electric Power Company, or TEPCO, began the test run early on Thursday ahead of full-fledged operation on Friday. More than 110,000 tons of the toxic wastewater has accumulated at the plant after months of using water to cool overheating nuclear fuel. The water is hampering work to bring the facility under control. TEPCO is struggling to find storage space for the water, which is accumulating at a rate of 500 tons daily. The treatment system combines 4 devices, including those made by French and US makers. The French-made device uses a special chemical agent to treat the contaminated water. The US-made device is designed to remove radioactive cesium. Tuesday's testing showed it reduced cesium by one-3,000th. TEPCO plans to reduce the level of radioactive substances to one-10,000th before moving decontaminated water to temporary tanks. Technical problems delayed the test by 4 days. TEPCO released the video of the work on June 15, and here it is, courtesy of Mainichi Shinbun. (You can download your own at TEPCO's site, here.) According to the caption of the video, it was shot by a Toshiba employee. For their 30-minute effort, they received between 5.88 to 7.98 millisieverts external radiation, twice of what had been planned. You get to see the contaminated water in the basement, toward the end. TEPCO started the test run of Areva's decontamination system at Fukushima I Nuclear Power Plant using the "low" contamination water at 1:10PM JST on June 15, according to the information to the press for June 15 (in Japanese only; no foreign reporters attend TEPCO's pressers). No word or information as to whether the test run has completed yet. After the successful test run of the Areva system, TEPCO will start the test run of both Kurion and Areva's systems together on June 16. The company hopes to start processing the "high" contamination water right after the successful test run of both systems. TEPCO is running out of storage space for the high contamination water at the plant. There is only 2,200 tons capacity left for the high contamination water at the plant before the water has nowhere else to go, according to Yomiuri Shinbun (link is in Japanese). Incidentally, the same information sheet from TEPCO says one worker at the plant was caught smoking a cigarette at the dock. At least he wasn't carrying a bucket of uranium like those at Tokai Nuclear Power Plant in 1999. What's interesting to me is the measurement of this worker's radiation, which was low. But the internal radiation exposure (0.24 millisievert) is almost twice as much as the external exposure (0.13 millisievert). Of course it is quite possible (even likely) that the external exposure number is not very trustworthy because of the deliberate under-counting which was almost the norm at any nuclear power plant in Japan for the maintenance work. #Radioactive Tea: Shizuoka Governor Accuses NHK of Spreading "Baseless Rumor"
Again, in "Newspeak" in post-Fukushima Japan, "baseless rumor" means "radioactivity". But this Oxford PhD governor of Shizuoka is hilarious. In his mind, the report in the newspaper and TV that some of Shizuoka's teas have been found with radioactive cesium exceeding the national safety limit is an unconscionable lie. He accuses the press for saying all Shizuoka's teas are radioactive, when none of them said anything remotely resembling that. The governor must be suffering a hysteria episode of a different kind. Concerning the detection of radioactive cesium exceeding the national provisional level from the "seicha" (final blend tea) in Shizuoka, Governor Kawakatsu held a press conference on June 14 and harshly criticized NHK for creating the "baseless rumor" [on Shizuoka's tea]. Governor Kawakatsu breathlessly accused the press, "The culprits for the baseless rumor are right here [he means the press]. On June 9, on the 9 o'clock national news [on NHK], they reported 'some tea in Shizuoka exceeded the provisional safety limit for radioactive materials.' What nonsense! They report as if the teas in entire Shizuoka Prefecture are radioactive. It is truly unconscionable." He continued, "Be responsible as the public media. People who read the newspaper headlines or watched NHK News now think all Shizuoka teas are radioactive. I demand that you apologize for having exaggerated. You will be held responsible, do you understand?" NHK's Nagoya Station said "We reported the facts and we stand by our report. We have no comments on the governor's remarks." Kurion, whose cesium absorbing zeolite towers are getting ready for the full-scale operation at Fukushima I Nuclear Power Plant, has two VCs (venture capital firms) investing in it: Firelake Capital in Palo Alto, California and Lux Capital in New York. Searching information on Kurion's vitrification method, I found this article instead. James Woolsey, the former CIA director and venture partner with VantagePoint Venture Capital, has joined Lux Capital along with Richard Foster, a McKinsey alum and prolific author. Woolsey is one of the regular speakers on the greentech circuits -- and one of the more interesting ones. He was one of the first to hammer home the lesson that green technology and national security are intertwined. Woolsey will concentrate on energy and Foster on life sciences. ...Ideally, Woolsey and Foster can help the firm create tighter links between its companies and established industries. Considering one of the largest target customers of Kurion is the US government, having Woosley won't hurt. TEPCO did the test run of Kurion's cesium absorption system on June 14, using the "low" contamination water. The samples after the test was taken at the end of the cesium absorption process, bypassing the decontamination system by Areva (which will be tested on June 15, also using the low contamination water). 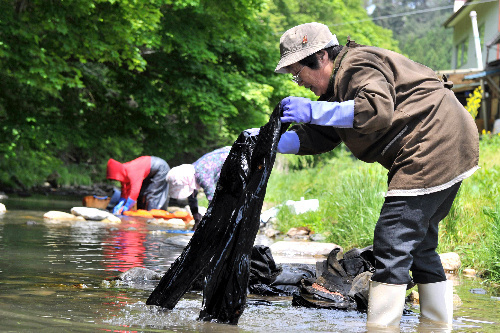 According to the number, the amount of cesium in the water was reduced to about 1/3000. (UPDATE) From TEPCO's Kashiwazaki-Kariwa Nuke Plant website (in Japanese only), I've learned that they test radiations in soil, water, food, etc. once every quarter in the area within 5 kilometers from the plant. The latest measurement data on the website is from 2009. It is a minute amount, but at least TEPCO's Matsumoto, who announced the news of the detection, didn't say "there is no effect on health" like its regulatory agency in the government or the government's cabinet secretary. The milk samples were taken on May 12. Niigata Prefecture is on the Japan Sea side. Kashiwazaki City, where radioactive cesium was detected from the milk, has Kashiwazaki-Kariwa Nuclear Power Plant, but TEPCO says cesium was from Fukushima I Nuke Plant. Well, the prevailing wind has switched, and now the plume from Fukushima I is often going inland, and sometimes all the way across to the Japan Sea. It is no surprise that radioactive cesium has been detected in Niigata. There is no escaping the radioactive particles. TEPCO announced on June 14 that a minute amount of radioactive cesium was detected in the raw milk produced in Kashiwazaki City in Niigata Prefecture. The amount was maximum 0.046 becquerel/liter, about 1/4000 of the limit set by the Nuclear Safety Commission. There has been no radioactive materials leak from Kashiwazaki-Kariwa Nuclear Power Plant, and TEPCO believes cesium came airborne from Fukushima I Nuclear Power Plant. The milk samples taken in Nagatori and Kitajo districts of Kashiwazaki City on May 12 were tested. Cesium-134 was detected at 0 to 0.025 becquerel/liter, and cesium-137 was detected at 0.021 to 0.025 becquerel/liter. TEPCO conducts regular surveys of radioactive materials in the area around Kashiwazaki-Kariwa Nuclear Power Plant, according to the agreement with the local municipalities. TEPCO's Junichi Matsumoto said, "We again recognize the enormity of this accident. We will consider testing the other agricultural crops [in Niigata?] and testing [the milk?] in Fukushima Prefecture." Americium was detected also, but the Ministry of Education and Science thinks it is a background number. Now the Japanese government has admitted to tellurium, plutonium, uranium, strontium, curium in the soil outside the plant. It is yet to admit how far and wide. Maybe in another month or two. The soil samples were taken on April 29 and May 1. According to the map attached to the above sheet, the two locations where curium was detected lie on the straight line from the plant, west by southwest. Japan's LDP: "Anti-Nuclear Movement Is Mass Hysteria"
Here we go, politicians true to form. The Secretary-General of the Liberal Democratic Party of Japan (LDP) Nobuteru Ishihara diagnosed people who don't want nuke plants as suffering a "mass hysteria". It's all in your heads, folks. The father of the LDP Secretary-General is Shintaro Ishihara, the governor of Tokyo since 1999. The LDP's Secretary-General [ Ishihara spoke in the press conference on June 14 and said about the "No Nuke" movement, "It is understandable that people are suffering a mass hysteria after a big accident (like the Fukushima I Nuclear Power Plant accident)"
His remark was in the context of pointing out the difficulty of securing the energy source other than the nuclear power, but it is conceivable that it will be criticized as inappropriate. There is a group of politicians across the party lines who want to build nuke plants deep underground (link is in Japanese at Asahi Shinbun). The membership includes 4 former prime ministers and several party leaders. Their idea is to bury the nuke plant once an accident happens, as if that would change the fact that Japan is an earthquake-prone country. Something bad is happening there that we aren't told of. They are all TEPCO employees. One of them worked in the central control rooms for the Reactors 3 and 4, five others worked outside the control rooms, maintaining electrical and measuring equipments. NISA's Nishiyama says it is regrettable. The Ministry of Health, Labor and Welfare announced on June 13 that 6 additional workers at Fukushima I Nuclear Power Plant may have exceeded the radiation exposure limit of 250 millisieverts. It was revealed by the quick testing done by TEPCO. All of them were male TEPCO employees. The maximum radiation was 497 millisieverts, counting both the external and the internal radiation exposures. They are currently undergoing more detailed testing. Earlier, two TEPCO employees at the plant had exceeded the limit, with the total radiation exposure of over 600 millisieverts. According to the Ministry, one of them has worked in the central control rooms for the Reactors 3 and 4 since the March 11 earthquake/tsunami, and the other 5 have worked outside the control rooms maintaining the electrical and measurement equipments. 6 additional workers (4 TEPCO employees, 2 TEPCO affiliate company employees) may also have received between 200 to 250 millisieverts radiation. The Ministry has instructed TEPCO to remove these 12 workers from the work at the plant. TEPCO has been testing the radiation exposure levels of 3,700 workers who have worked at the plant so far, and reported the result of about 2,300 workers by June 13. Junichi Matsumoto of TEPCO said, "Initially, we did not conduct the radionuclide analysis in the air and we didn't fully understand the work condition, and that led to the internal radiation of the workers. We will investigate the situation further, including whether the workers wore masks." The Nuclear and Industrial Safety Agency (NISA) spokesman Hidehiko Nishiyama said, "It is highly regrettable. As soon as the definite numbers for the radiation exposures for the 6 workers become known, we will instruct TEPCO to report immediately and to investigate the cause thoroughly." 3 months after the accident, in the NISA's mind it is still a local accident caused by a private business. He left a note, which said "If only there was no nuke plant..."
The dairy farmer lived outside the evacuation zones (mandatory and planned). Part of his despair was that he wouldn't get compensated for his loss and hardship by the government because he lived outside the government-ordered evacuation zones. He was probably, and sadly, right. Soma City is about 43 kilometers from Fukushima I Nuclear Power Plant. It was revealed on June 13 that a dairy farmer in his 50s had committed suicide, leaving a note saying "if only there was no nuke plant". He had already killed his cows and given up on his dairy farming. According to people who knew him, the farmer's body was found in the barn on June 11. He had written on the wall of the barn with a piece of white chalk, "I don't feel like working any more," and "for those of you still in dairy farming, don't let the nuke plant get you down." The farmer lived in the area where the shipment of raw milk was initially halted, and he was dumping all the milk he milked from his cows. By the beginning of June, he had disposed about 30 cows. He had succeeded his parents in dairy farming. His elder sister told the Yomiuri reporter that she was reluctant to talk about his brother's death for the sake of his children, but she wanted to tell people about the nuke plant [and how it destroyed his brother]. One of the fellow dairy farmers, a 51-year-old man, said "He kept saying there would be no compensation [from the government] because he was not in the evacuation zones." A 53-year-old farmer who knew him said, "Every time I contacted him, he was distressed that he had lost everything, thanks to the nuke plant." 57% of eligible voters in Italy voted, and 94% of those who voted said no, according to exit polls. Italian Prime Minister Silvio Berlusconi waved goodbye to nuclear power as Ministry of the Interior figures confirmed that the turnout for a national referendum was sufficient to repeal a law setting out plans for new plants. According to Reuters, figures from the Interior Ministry showed turnout was running at 57 per cent with some 98 per cent of the vote counted. For any referendum verdict to be legally accepted, a quorum of 50 per cent plus one of the Italian population must be reached. With exit polls indicating that 94 per cent of voters in the nuclear referendum voted against Enel's plans to build four Areva EPRs, Berlusconi's nuclear ambitions appeared to be thwarted. Berlusconi, facing mounting problems since heavy local election losses last month, appeared to concede defeat at least in the nuclear referendum when he told a news conference the vote had probably ended prospects for atomic energy in Italy. "Following the decision the Italian people are taking at this moment, we must probably say goodbye to the possibility of nuclear power stations and we must strongly commit ourselves to renewable energy," he said. (Reuters) - Italians began voting in four referendums on Sunday that could strike a new blow against Prime Minister Silvio Berlusconi, who is still stinging from heavy local election losses last month. The centre-left opposition has been leading a spirited campaign to get voters out to cast their ballots on the questions, which concern the privatisation of water utilities, nuclear energy and whether government ministers can be exempt from attending trials against them. A central issue will be whether enough voters turn out to ensure the necessary quorum of 50 percent plus one vote. But if they repeal existing laws by voting yes, the result will likely have repercussions on his fractious centre-right coalition. The referendum on nuclear power is the most emotive of the four, in the wake of the disaster at Japan's Fukushima reactor in March. Polls say most Italians are against nuclear energy, which they consider unsafe in a country prone to earthquakes. Berlusconi is a big proponent of nuclear power, which the centre right says is indispensable for the future of a country that imports nearly all its energy. Last year the government passed a law to re-start a nuclear energy programme, which was halted in 1987 by another referendum. Aware of the likely backlash following Fukushima, the government has suspended the plans but a referendum could block atomic power for decades. Japan's Yomiuri rather anxiously reports that on June 12 alone, 41% of eligible voters (Italian citizens age 18 and above, about 47 million) cast their vote. The voting will close on 3PM local time on June 13, and the vote counting will commence immediately. Arnie Gundersen's latest video talks about "hot particles". He mentions a metallic taste experienced by some people in Japan and on the west coast and says it is a sign of radiation exposure. Hot Particles From Japan to Seattle Virtually Undetectable when Inhaled or Swallowed from Fairewinds Associates on Vimeo. To defend TEPCO somewhat, though, it was not TEPCO who doubled the estimate of the radioactive materials released from Fukushima I Nuclear Power Plant; it was the government agency, the Nuclear and Industrial Safety Agency. There is another on-going and little-reported crisis in Japan aside from Fukushima I Nuclear Power Plant: non-recovery from the March 11 earthquake and tsunami and worsening health crisis in Tohoku. The Japanese government seems to take advantage of stoic perseverance that has always been the virtue of Tohoku people. Since they don't hear loud complaints, they don't do anything. The Self Defense Force has decreased the number of cleanup crews in the affected areas, even though hardly anything seems to have been cleared. Most of Japan has entered the rainy season, and the typhoon season is also approaching. There are still nearly 90,000 people living in the official shelters throughout the region. As the politicians fiddle, despair seems to be deepening in Tohoku. The guest post by Tokyo Brown Tabby highlights, of all things, rotten fish and their health implications for the residents. And that bit about temporary housing is so stereotypically and bureaucratically Japanese. Did you know that once you get your temporary housing, you can't receive food any more because you are no longer in the official shelter? And once in the temporary house you get to pay your utilities, too, whether you have a job or not. Remember, many of these people do not have a cent (I should say yen) on them, as they didn't have time to take much when they barely escaped from tsunami. It is very hard to believe this is (or was) the technologically advanced, 3rd largest economy in the world. With the rainy and typhoon seasons approaching and temperature rising, there are serious concerns that infectious diseases might spread in the earthquake/tsunami-struck areas. From what? Rotten fish. When the earthquake and tsunami destroyed the refrigerated storage and processing facilities for fish, the fish started to rot. They have been spraying insecticides and deodorizers in vain, since huge amount of rotten seafood products are still under piles and piles of rubble. Unless all the debris and rubble, rotten fish and all that are completely removed, there is no stopping the hideous smells and mass breeding of those pests that could transmit diseases. On June 12, on a night news program called "Mr. Sunday" (Fuji TV), they showed a short video clip of a school baseball team practicing wearing gauze masks. It was a strange sight. Without the masks, many would get sick from the bad smell, the coach said in the video. -More than 20,000 temporary houses have been built, but only about 45% of them are occupied, because once evacuees move to these temporary houses, all the food supply would be cut off and they would have to pay for utilities even though many of them are still unemployed. -Number of volunteer workers during the 3 month period since the earthquake occurred is only one third of those in Kobe Earthquake in 1995; the affected areas this time are far wider, and much farther and much harder to travel to from the big cities. According the Ministry of Defense website, about 69,200 members of Self-Defense Forces are in action as of June 10, which have shrunk from the maximum number of more than 100,000. But it seems that more is needed, more efforts from government are needed, to remove those endless piles of rubble. Otherwise, having survived the devastating earthquake and tsunami, people in the affected areas in Tohoku might lose their precious lives to infectious diseases which is totally avoidable. This is another imminent crisis. I hope the world and the international health community will pay attention to this issue. So, it looks like one of the 4 subsystems is not functioning. From yesterday's earlier information, it sounded as if not enough water was going through one of the 4 subsystems, but it turns out that no water was going through at all. A problem was found in the cesium absorption system by the US company Kurion. During the test using seawater on June 11 evening, TEPCO found out that the water did not flow through one of the 4 subsystems. Upon investigation on June 12, TEPCO found the valve that was supposed to open and close automatically was not working. The company is looking into the software program that controls the valve. The system was hastily assembled, for sure. I hope it was not hastily tested before it reached Fukushima. Even the Nuclear and Industrial Safety Agency's spokesman Nishiyama is not too happy. Somehow, I get this feeling that the snafu is not over with the contaminated water treatment complex. I don't know whether Kurion and France's Areva have worked together in the past to assemble a system that incorporates their individual systems. The next process after the Kurion's cesium absorption tower is the Areva's decontamination system. I don't want to hear the fundamental engineering error again, but wouldn't be surprised to hear it: units of measurement. By now, all engineering companies use the metric system, I hope. Japan and France use the metric system. Does Kurion? Radioactive strontium (strontium-89 and -90) was detected from the sub-drain pits at the Reactor 1 turbine building and the Reactor 2 turbine building. The samples were taken on May 18. It is the first time that radioactive strontium was detected from the groundwater at Fukushima I Nuclear Power Plant. The sub-drain pits are located outside the turbine buildings to collect groundwater so that the basements don't get flooded. In addition, strontium-89 and -90 were detected from the seawater samples taken on May 16 at 3 locations: at the water intake canals for the Reactors 1 through 4, inside the silt screen for the Reactor 2, and inside the silt screen for the Reactor 3. The amount of strontium-90 in the seawater inside the silt fence for the Reactor 3 was 240 times as high as the legal limit allowed for nuclear plant operations. Part of the contaminated water treatment system being readied at Fukushima I Nuclear Power Plant is the cesium absorption tower using the technology of Kurion, a US start-up with very little information on their corporate website. TEPCO discovered that not enough water was flowing through one of the 4 subsystems, and suspects it's clogged up somewhere. And a bit of new information that the Kurion's system removes not just cesium but technetium and iodine, according to the press conference handout from TEPCO which is found below. By the way, the number of pipe leaks in the Areva's system was not "over 10". Well, it was "over ten" for sure, but it was actually 48. TEPCO announced on June 12 that the test run of the system to treat highly contaminated water at Fukushima I Nuclear Power Plant would be delayed after June 13. The delay was due to the problem in one of the systems where less amount of water was processed than planned. TEPCO is investigating. The system in question is the Cesium Absorption Tower by the US company Kurion. There are 4 subsystems, and the water that flowed through one of them was much less than planned. It is possible that the subsystem is clogged somewhere. TEPCO could run the remaining 3 subsystems, but the water processing speed would decrease to 75% of the full capacity. TEPCO finished the repair of the 48 leaks in the pipes. The company also finished correcting the mistakes in the software program that controls the pumps, which were discovered on June 11.